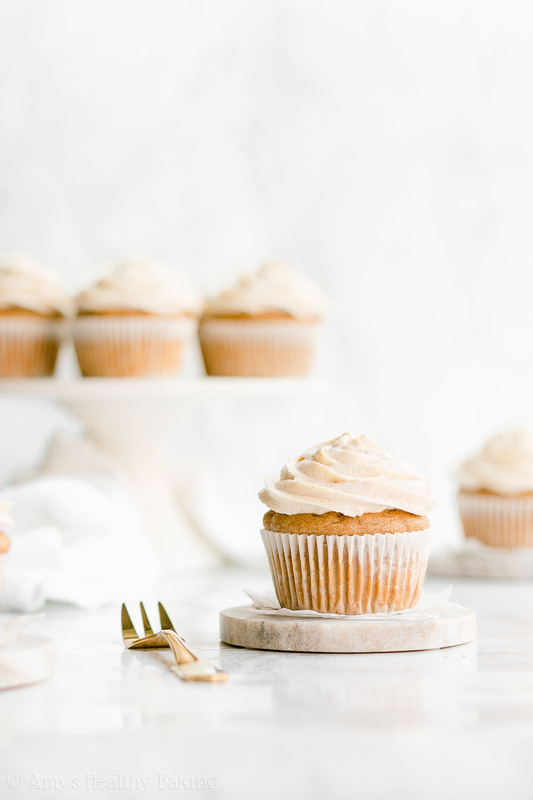 Learn how to make these elegant eggnog cupcakes from scratch! It’s easier than you think! They’re only 130 calories with no refined flour or added sugar too! A few years ago in early December, my mom’s birthday landed on a Saturday, so my dad and I treated her to an afternoon and evening of fun. We let her pick out the activities she wanted to do, which led us to the neighboring town. We started by walking around “the house with a bazillion lights” (as my brother and I called it during our childhood! ), one of the most impressively decorated houses during the holidays in our area. Afterward, we drove downtown for birthday dessert. A couple of weeks earlier, I had walked past a little French patisserie a few doors down from the movie theater, and after browsing through their menu online, I suggested it to Mom. I know how much she loves Paris and thought it’d be the perfect dessert place for her! Once inside, we took our time looking through their glass display cases full of sweets, strolling back and forth at least three times before picking out some treats. We settled on five small desserts to split between the three of us, and after paying at the register, we carried our plates over to one of the dainty white tables and chairs to enjoy. As two big chocoholics, Mom and I both selected a really rich and chocolaty treat, and Dad actually did the same too. We also purchased two others with fruit and caramel flavors, and none of us could pick a favorite between all five. They all tasted amazing… And made us want to take another Paris vacation! 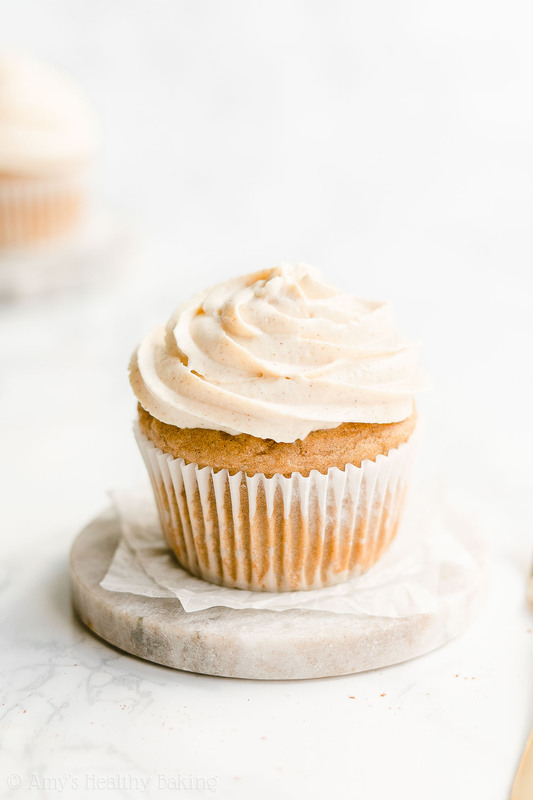 These Healthy Eggnog Cupcakes! They’re really moist and tender, and they taste just like the holidays with lots of sweet eggnog and warm spice flavors. Yet unlike traditional cupcakes, these contain no refined flour or added sugar and just 130 calories! I think that would make Mom really happy! 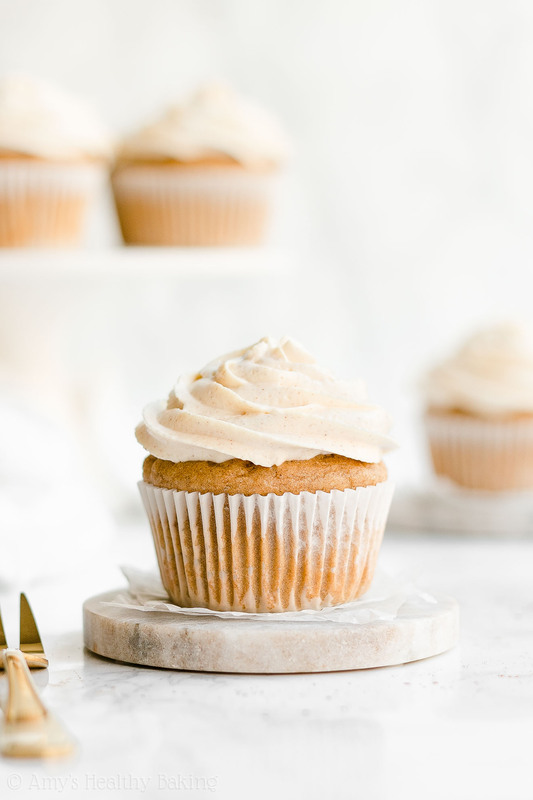 So let’s go over how to make these healthy eggnog cupcakes! To make the batter, you’ll start with white whole wheat flour and two spices, cinnamon and nutmeg. It’s nearly impossible to make eggnog-flavored treats without nutmeg, and Mom always sprinkles a bit into each small glass she drinks during the holidays. Such a perfect pair! And yes, white whole wheat flour actually exists… And it’s not simply a combination of white (aka “all-purpose”) flour and regular whole wheat flour! Instead, white whole wheat flour is made by finely grinding a special type of soft white wheat (hence the name! ), whereas regular whole wheat flour comes from a heartier variety of red wheat. They have the same health benefits (like extra fiber! 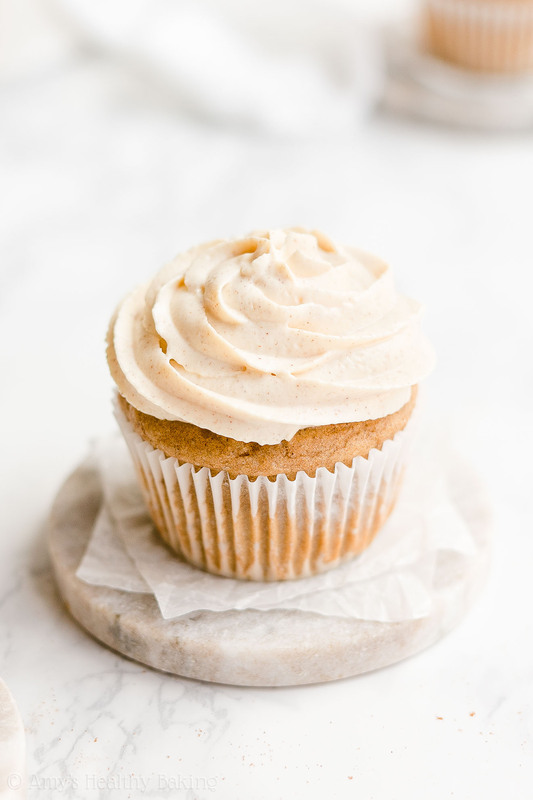 ), but white whole wheat flour has a lighter taste and texture… Which lets the moist and tender texture of your healthy eggnog cupcakes truly shine! Unlike traditional recipes that call for ½ cup (or more!) of butter or oil, your healthy eggnog cupcakes only require ½ tablespoon. That shaves off over 760 calories—hooray! That small amount of butter really helps keep these healthy eggnog cupcakes low calorie and low fat. Greek yogurt! It adds the same moisture to your cupcake batter as extra butter or oil but for a fraction of the calories, and it also gives your healthy eggnog cupcakes protein boost. I call that a win-win! Time to sweeten the batter! You’ll actually use a combination of two sweeteners: liquid stevia and granulated erythritol. Just like stevia, erythritol is also a sweetener that comes from plants. It generally sweetens cup-for-cup like granulated sugar, so you’ll add more than the concentrated liquid stevia. This is the one I use! I try really hard to only use one sweetener in my recipes to keep things simple, but I found that using just liquid stevia didn’t work. Even when I added more than 4 teaspoons, I couldn’t get the cupcakes to taste sweet enough, but using the erythritol completely solved that issue. 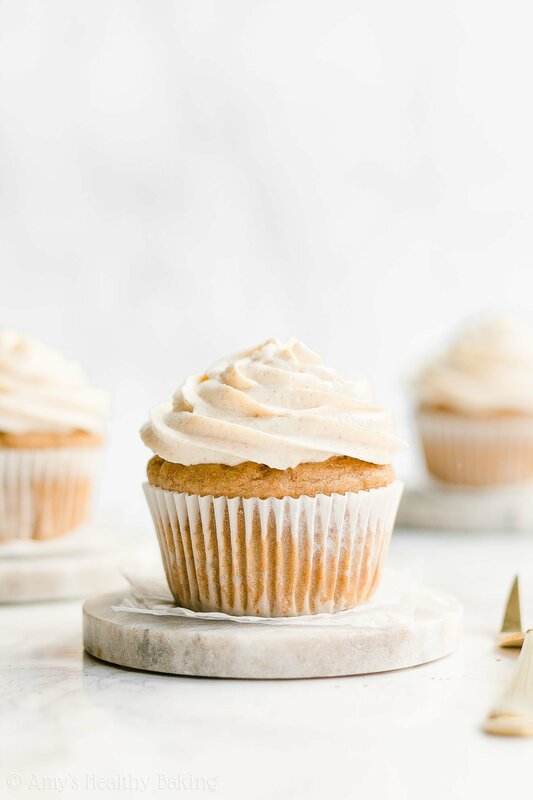 Instead of tasting like muffins, these healthy eggnog cupcakes definitely taste like sweet bakery-style cupcakes! So pretty pretty please… Use both sweeteners! 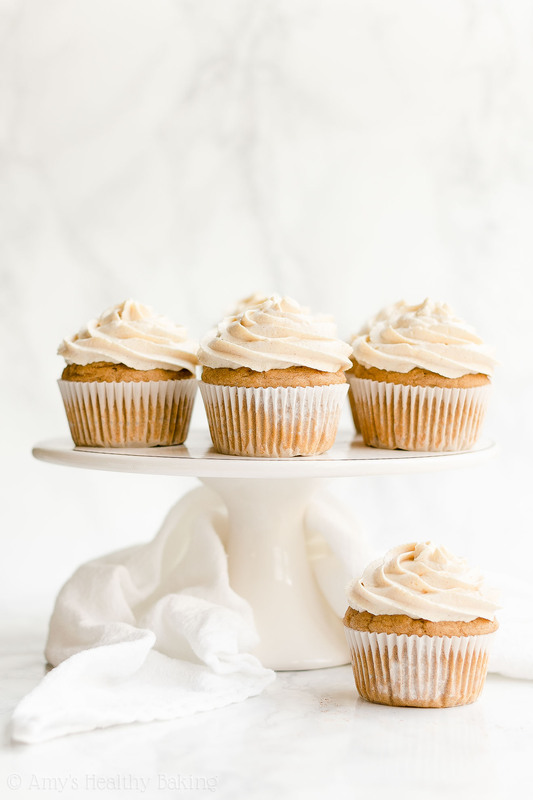 One last tip about these healthy eggnog cupcakes before we move on to the frosting! Because low fat batters like this one tend to stick to cupcake liners like superglue, you must coat your cupcake liners with cooking spray. This little trick allows the liners to peel away much more easily! Pretty nifty, right? 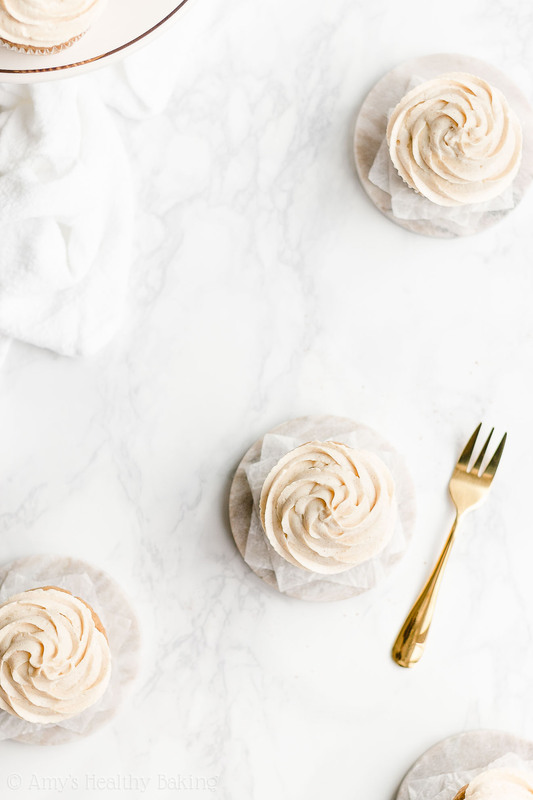 So now that your healthy eggnog cupcakes are in the oven, it’s time to make the healthy cinnamon frosting! Yup, cinnamon. 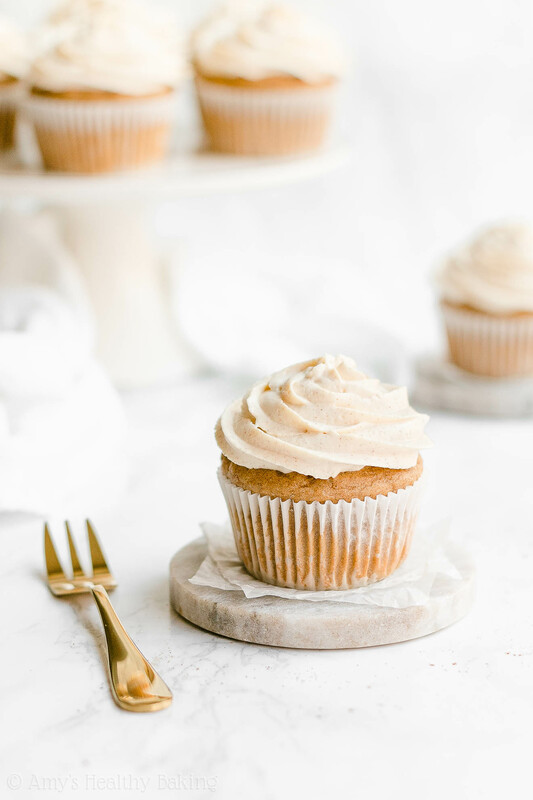 Because eggnog cupcakes + spiced frosting = YUM. And you’ll start with… More Greek yogurt! Protein-packed frosting is one of my favorite things. ? Then you’ll mix the Greek yogurt with cinnamon, more liquid stevia, and instant pudding mix. Yes, I know. Instant pudding mix sounds so strange for frosting. But it’s a great little trick! The instant pudding mix thickens the Greek yogurt, so after chilling your frosting for two hours, it’s the same pipe-able consistency as regular buttercream frosting. But without using any butter or powdered sugar. How cool is that?? And try to stop after eating just one! (If you can figure out how, let me know… I always seem to reach for seconds!) ? And when you make your own, remember to snap a picture and share it on Instagram using #amyshealthybaking and tagging @amyshealthybaking IN the photo itself! (That guarantees I’ll see your picture! 😊) I’d love to see your healthy eggnog cupcakes! These cupcakes are such a fun treat for the holidays! 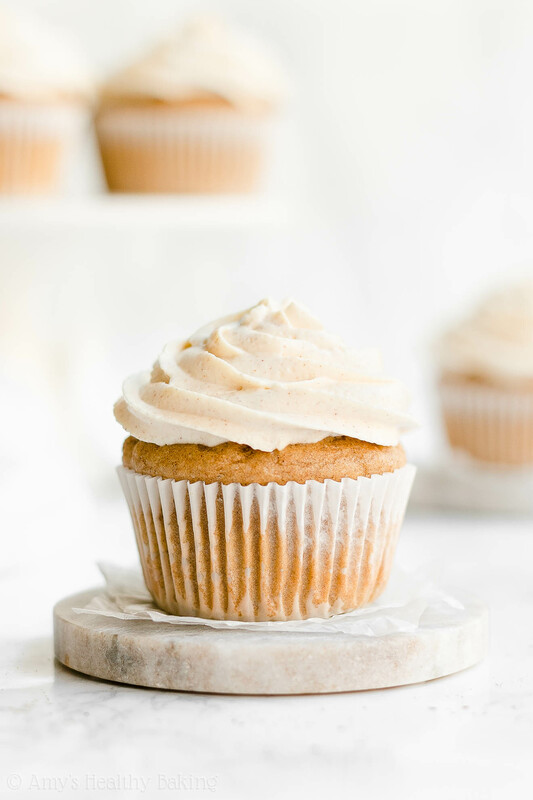 They’re full of sweet eggnog and warm spice flavors, and the creamy cinnamon frosting is a lovely finishing touch. The cupcakes are best if eaten the same day they’re frosted, but leftovers will keep for at least three days (if not longer!) if stored in an airtight container in the refrigerator. To prepare the cupcakes, preheat the oven to 350°F. Line 12 muffin cups with paper liners, and coat the liners with cooking spray. Divide the batter between the prepared paper liners. Bake at 350°F for 20-24 minutes or until the centers feel firm to the touch and a toothpick inserted into the center comes out clean. Cool in the pan for 5 minutes before transferring to a wire rack to cool completely. While the cupcakes bake, prepare the frosting. Add the Greek yogurt, instant pudding, cinnamon, and liquid stevia to a large bowl. Beat with an electric hand mixer or stand mixer for 2 minutes. Cover the top of the bowl with foil, and refrigerate for at least 2 hours. Once the cupcakes have completely cooled, pipe the cinnamon frosting on top just before serving. Notes: For the gluten-free flour, use the following blend: 1 cup (120g) millet flour, ¾ cup (90g) tapioca flour, ¾ cup (90g) brown rice flour, and 1 ½ teaspoons xanthan gum. Most store-bought gluten-free flour blends (like this one!) should work as well, if measured like this. I highly recommend using the liquid stevia! It’s one of my favorite ingredients (you’ll use it in all of these recipes of mine! ), and I buy it online here because that’s the cheapest price I’ve found. I do not recommend substituting for it in the cupcake batter. If you do, you’ll need to reduce the amount of eggnog to compensate, and your cupcakes won’t taste like eggnog as a result. If you prefer not to use the liquid stevia in the frosting, then substitute 1 ½ teaspoons of this powdered stevia OR ¼ cup of granulated sugar. I buy my erythritol online here. If you prefer not to use erythritol in the cupcakes, substitute 6 tablespoons (72g) of granulated, brown, or coconut sugar. I actually prefer using vegan almond milk nog in these cookies! This is the one I found at Target, and it tastes just like regular eggnog. Both vegan eggnog and light eggnog work equally well, so use whatever you prefer! This is the instant pudding mix I use. You just need the dry instant pudding mix—don’t prepare it according to the package directions! You may omit it, but you’ll need to increase the liquid stevia. Without the instant pudding mix, the frosting will no longer be stiff enough to pipe, so you’ll need to spread it on the cupcakes instead. Is there an organic instant pudding that would work. I won’t use anything with aspartame. I really appreciate your interest in my recipe Mary! I haven’t tried any organic instant pudding mixes before, but I did provide an alternative that omits the instant pudding mix in the Notes section of the recipe, located directly underneath the Instructions. I know it can be easy to miss that part! 🙂 I’d love to hear what you think of these cupcakes if you try them! Perfect ode to your mom and the Christmas season! I really appreciate your interest in my recipes Wanda! If you look at the Notes section, I’ve actually included an option for the frosting that doesn’t use the instant pudding mix. 🙂 I’d love to hear what you think if you try these cupcakes! Hey Amy, thanks for sharing the blog. It is really very amazing. I will try to make these cupcakes at my home and will send you the review. Keep sharing! I can’t wait to hear what you think of these cupcakes Alyssa!